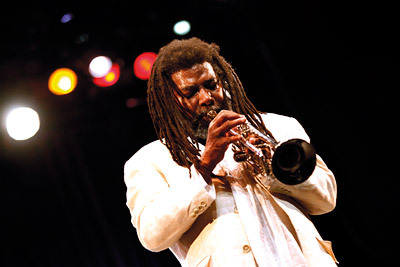 Wadada Leo Smith (b.1941) has been active in creative contemporary music as a trumpeter and multi-instrumentalist, composer and improviser for close to five decades. Born in Leland, Mississippi, Smith´s early musical life began in the concert and marching bands of Lincoln High School in Leland, first on the mellophone, then moving on to the French horn and finally receiving his first trumpet at the age of 12. At the same age, he also composed a work for three trumpets, his first composition. From that time forward, Smith considered himself a composer and performer and his life centered around music. At the age of 13, he became immersed in the Delta blues and began to perform in blues bands all across the Mississippi delta region. Smith also developed an interest in improvised music traditions, listening to the likes of Louis Armstrong, Benny Goodman and Harry James on the radio. In his own research on composition as a teenager, he initially focused on African-American composers, such as Scott Joplin, William Grant Still, Duke Ellington, W. C. Handy and Thomas "Blind Tom" Wiggins, but, in later years, he also studied extensively African, Asian, European and American music traditions. While still in high school, Smith already led his first jazz group. Smith received his initial musical education from his stepfather, Alex "Little Bill" Wallace, who was one of the first Delta blues singers to begin playing the electric guitar. His family home in Leland was a meeting place for musicians where blues artists, such as Elmore James, B.B. King and Little Minton, were frequent guests, often performing in the family´s living room. Accordingly, Smith has said that: "The Blues was my first language and it never went away." As a trumpeter, Smith considers himself a descendant of Louis Armstrong, although Miles Davis, Booker Little and Clifford Brown and, a bit later, Don Cherry had the strongest impact on his own playing as a young musician. Smith´s formal music studies began with Earl Jones and Henderson Howard, who were his school bandmasters at Lincoln High, with the latter also being his first trumpet teacher. Smith later studied at the U.S. Army School of Music at Fort Leonard Wood in Missouri (1963), the Sherwood School of Music in Chicago, Illinois (1967-69), and the Wesleyan University in Middlewood, Connecticut (1975-76). His own music theory and notational system for improvisation in an ensemble context, which he calls "Ankhrasmation,"has been significant in his development as an artist and educator. Smith published his music philosophy already in the early 1970s in notes (8 pieces), source a new world music: creative music (Kiom Press, 1973). After high school, Smith travelled for about a year with various blues, rhythm ‘n´ blues and soul groups before entering the U.S. Army. In addition to attending the U.S. Army School of Music, Smith played for a total of about five years in six different army bands, touring not only in the Southern United States, but also in France and Italy. He also continued to broaden his musical horizons and was leading his own Ornette Coleman-inspired trio while still in the military. In 1967, Smith left the army and moved to Chicago to work with saxophonist Anthony Braxton and other members of the Association for the Advancement of Creative Musicians (AACM), the creative music collective that combined the music´s African roots with an improvisational approach. Soon after his arrival in Chicago, Smith met Anthony Braxton and violinist Leroy Jenkins for an impromptu practice session and, as a result, the three founded the Creative Construction Company, a collaborative group that became one of the key early ensembles of the AACM. Smith´s other collaborators in the pioneering work of the AACM included saxophonists Joseph Jarman, Roscoe Mitchell and Kalaparusha Maurice McIntyre, trumpeter Lester Bowie, trombonist George Lewis and pianist Muhal Richard Abrams. Smith´s first recordings were also made in Chicago during this period under the leadership of Braxton (3 compositions of new jazz in 1968 and Silence in 1969; these albums included Smith´s first recorded compositions, "The Bell" and "Silence," respectively, which already used the rhythm-units concept, a framework for improvisation that Smith developed more fully in the 1970s), McIntyre (Humility In The Light Of The Creator in 1969) and Abrams (Young At Heart, Wise In Time in 1969). Like many other AACM members, Smith supported himself by playing in the horn sections of various rhythm ‘n´ blues and soul bands, including Little Milton Campbell´s group. In 1969, Smith turned down Little Milton´s offer to become the straw-boss of his road band and moved to Paris together with Anthony Braxton and Leroy Jenkins as well as a few other key members of the AACM. During his year in Paris, Smith took part in two important recordings by Braxton for the BYG Actuel label (Anthony Braxton in 1969 and This Time… in 1970) with a quartet that also included Jenkins and drummer Steve McCall. However, perhaps the most legendary line-up of this period was an expanded version of the Creative Construction Company (with Smith, Braxton, Jenkins, Muhal Richard Abrams, bassist Richard Davis and McCall), which was recorded live in May 1970 in connection with the AACM´s first concert in New York City (Creative Construction Company and Creative Construction Company 2). Smith worked with Braxton throughout the 1970s, including in Braxton´s quartet with Smith, bassist Dave Holland and drummer Phillip Wilson and other small groups as well as on Braxton´s classic big band recordings, Creative Orchestra Music 1976 and Creative Orchestra (Koln) 1978. Since that time, Braxton and Smith have continued to play together from time to time. After his year in Paris, Smith led his own group, Integral,with saxophonist Henry Threadgill, trombonist Lester Lashley and drummer Thurman Baker, for a few months in Chicago before settling in New Haven, Connecticut, during the summer of 1970 for a period of ten years. In New Haven, Smith concentrated on his own music as well as studying and teaching rather than touring and recording all over the world like many of his compatriots. In addition to leading his own groups and teaching at the University of New Haven, he studied ethnomusicology at the Wesleyan University, focusing on West African, Japanese, Indonesian and Native American music cultures. Soon after arriving in New Haven, Smith organized the Creative Improvisation Ensemble with saxophonist Marion Brown and they also recorded a duo album in December 1970 in New York City (Creative Improvisation Ensemble/Duets). Smith´s first recording as a leader was a solo album (Creative Music-1 in 1971), which was also the first album released on Kabell, the independent record label he had founded. After this first solo recording, Smith has continued to perform solo concerts and has recorded three additional solo albums (Solo Music/Ahkreanvention in 1979, Kulture Jazz in 1992 and Red Sulphur Sky in 2001). Smith´s principal ensemble in New Haven, New Dalta Akhri, was comprised of his students and other young musicians based in the area and recorded a number of albums (Reflectativity, Song of Humanity, The Mass Of The World, Divine Love, Spirit Catcher and Go In Numbers). At various times, its members included saxophonists Dwight Andrews, Oliver Lake and Henry Threadgill, pianist Anthony Davis, vibraphonist Bobby Naughton, guitarist Michael Gregory Jackson, bassist Wes Brown and drummer Pheeroan akLaff, among others. Members of New Dalta Akhri were also part of the two large orchestras responsible for Smith´s first big band recordings, Leo Smith Creative Orchestra (Budding Of A Rose in 1979) and Leo Smith & The Creative Improviser Orchestra (The Sky Cries The Blues in 1981). During the New Haven period, Smith recorded as a member of the Jazz Composer´s Orchestra under the direction of trumpeter/trombonist Clifford Thornton (The Gardens Of Harlem in 1974) and Leroy Jenkins (For Players Only in 1975). He also recorded with Marion Brown (Geechee Recollections in 1973), saxophonist Frank Lowe (The Flam in 1975 and Doctor Too-much in 1977), Bobby Naughton (The Haunt in 1976), Michael Gregory Jackson (Clarity in 1976), Phillip Wilson (Fruits in 1978) and Roscoe Mitchell (Sketches From Bamboo in 1979) and began his longstanding relationship with certain key figures in European improvised music, such as guitarist Derek Bailey (Company 5, Company 6 and Company 7, all in 1977, with the collective personnel of Bailey, trumpeters Smith and Steve Beresford, saxophonists Anthony Braxton, Steve Lacy, Evan Parker and Lol Coxhill, cellist Tristan Honsinger, bassist Maarten Altena and drummer Han Bennink) as well as bassist Peter Kowald and drummer Günter "Baby" Sommer (Touch The Earth in 1979 and If You Want The Kernels, You Have To Break The Shells in 1981). In the early 1980s, Smith converted to Rastafarianism and recorded a series of albums that reflected this new spirituality, including Human Rights, Procession Of The Great Ancestry and Rastafari. The music that Smith performed around this time sometimes featured lyrics inspired by Rastafarianism and introduced elements of fusion jazz, reggae, funk and the blues into the music. Smith also became increasingly interested in presenting multi-media performances incorporating song, dance and drama. In 1986, Smith began a series of trumpet/drums duos by recording a live concert with drummer Ed Blackwell (The Blue Mountain´s Sun Drummer,released on Smith´s Kabell label in 2010). This series also includes duo recordings with Adam Rudolph (Compassion in 2002), Günter "Baby" Sommer (Wisdom In Time in 2006), Jack DeJohnette (America in 2008) and Louis Moholo-Moholo (Ancestors in 2011, TUM CD 029) as well as a yet-to-be-released duo recording with Hamid Drake. In recent years, Smith has also made a number of other duo recordings, including those with vibraphonist Gustavo Aguilar, trombonist Jeb Bishop, Anthony Braxton, guitarist John Coxon, pianist Matthew Goodheart, laptop computer artist Ikue Mori and poet Harumi Makino Smith. In 1993, Smith accepted a teaching position at the California Institute of the Arts and has made Southern California his home ever since. While teaching was a full-time occupation, Smith continued to lead his own groups, in particular N´Da Kulture, and recorded a number of highly acclaimed albums (e.g., Tao-Njia, Golden Hearts Remembrance, Light Upon Light, Luminous Axis and Reflectativity) as a leader. In the mid-1990s, Smith had converted to Islam, which further strengthened, and made more apparent in his music of this period, his longstanding interest in the musical cultures of the East, including those of Japan and India. After his move to California, Smith began performing with other improvising musicians based on the West Coast, such as saxophonists Mario Eneidi and Vinny Golia, bassists Adam Lane and Bertram Turetzky, members of the Rova Saxophone Quartet and guitarist Henry Kaiser (in Yo Miles!, a group co-led by Kaiser and Smith and dedicated to the music of Miles Davis´ electric period), while continuing his collaborations with the likes of Anthony Braxton, Douglas Ewart, Susie Ibarra, John Lindberg, Roscoe Mitchell, Matthew Shipp, Spring Heel Jack and John Zorn, among many others. Smith currently leads four principal ensembles of his own: Golden Quartet, an all-star group that originally included pianist Anthony Davis, bassist Malachi Favors Magoustous and drummer Jack DeJohnette and, in later editions, pianist Vijay Iyer or Angelica Sanchez, bassist John Lindberg and drummer Pheeroan akLaff or Shannon Jackson (Golden Quartet in 2000, The Year Of The Elephant in 2002, Tabligh in 2005 and, expanded into the Golden Quintet with drummer Don Moye, Spiritual Dimensions-CD1 in 2008); Mbira, a trio with pipa player Min Xiao-Fen and Pheeroan akLaff (Dark Lady of the Sonnets in 2007, TUM CD 023); Organic, a larger group with instrumentation consisting primarily of electric string instruments (Spiritual Dimensions-CD2 in 2008 and Heart´s Reflections in 2010); and the Silver Orchestra, a large orchestra that recorded its first album in 2004 (Lake Biwa). Smith has been a prolific composer throughout his career with works ranging from solo piano pieces to compositions for multiple orchestras. Already when in the military in the 1960s, Smith arranged both popular and classical music for the various military bands he played in and also increasingly began composing his own music both for jazz groups and for other ensembles. By the time Smith moved to Chicago in 1967, he had already composed several string quartets and orchestral works. When working with other members of the AACM and, in particular, in the large ensembles led by Muhal Richard Abrams and others, Smith began to combine his compositional skills and the improvisational spirit of the early AACM ensembles in search of his own approach for orchestral improvisation. By 1970, Smith had developed the two basic systems of music that he has utilized in his compositions ever since: the system of rhythm-units and the notation system he termed "ahkreanvention," which literally means to create and invent musical ideas simultaneously, utilizing the fundamental laws of improvisation and composition. With the rhythm-unit concept, each single sound or rhythm, or series of sounds or rhythms, is accepted as a complete piece of music. Each performer, in turn, is considered as a complete unit with each having his or her own center from which each performs independently of any other, whether performing in a small group or in an orchestral context. The independence of each sound-rhythm and the independence of each performer contributes to the liberation from time as a period of development and to its employment as an element of space instead, as evidenced by the music on Occupy The World. Smith´s music for large ensembles has been performed throughout the world since 1969, developing from early works for more traditional big bands to compositions for multi-ensembles. Smith has received a number of awards and commissions as a composer and his compositions have been performed by numerous contemporary music ensembles, including the AACM Orchestra, the Kronos Quartet, the Da Capo Chamber Players, the New Century Players, the San Francisco Contemporary Music Players, the Contemporary Chamber Players (University of Chicago), the S.E.M. Ensemble, the Southwest Chamber Music, the Del Sol String Quartet, the New York New Music Ensemble, ne(x)tworks, the California E.A.R. Unit and the Oxford Improvisers Orchestra, among others. In May 2012, Smith released his most extensive recording to date, Ten Freedom Summers, a four-CD collection of a total of 19 works composed over a period of 34 years and inspired by the civil rights movement in the United States. Ten Freedom Summers was recorded by the Golden Quartet (Smith, Anthony Davis, John Lindberg and Pheeroan akLaff) and the Golden Quintet (add drummer Susie Ibarra) together with Southwest Chamber Music. TUMO, or Todella Uuden Musiikin Orkesteri, is a new large ensemble that performed for the first time at TUMfest12 in Helsinki, Finland, in February 2012. TUMO is not intended to become an institutionalized orchestra. Instead, it is a loose aggregation of musicians with a shared interest in creative improvised music. In many cases, they also have had a prior affiliation with TUM Records through various other groups and projects. The idea behind TUMO goes back to the big band workshops of the late 1960s and early 1970s that were organized particularly in Germany (e.g., Baden-Baden, Berlin and Donaueschingen), Holland and the United Kingdom but also at other European jazz festivals. Part of the thinking behind TUMO also comes from The Jazz Composer´s Orchestra which, in the 1960s and 1970s in New York City, offered contemporary composers, such as Carla Bley, Don Cherry, Leroy Jenkins, Michael Mantler, Grachan Moncur, III, Roswell Rudd and Clifford Thornton, an opportunity to compose and perform creative music with a large ensemble made up of their contemporaries. At its premier at TUMfest12, TUMO performed under the leadership of Wadada Leo Smith, who had also composed the music performed. In many ways, one could not have had a more appropriate choice inasmuch as Smith has already been involved in many of the orchestras of the past that have served as an inspiration for TUMO, starting with the large ensembles organized by Chicago´s AACM in the 1960s under the leadership of Muhal Richard Abrams and others. When in Europe in the late 1960s and early 1970s, Smith participated in some of the most legendary meetings between American and European creative musicians (including early Company sessions in the United Kingdom and playing with local improvisers in Holland). He also played and recorded with The Jazz Composer´s Orchestra (The Gardens Of Harlem with Clifford Thornton and For Players Only with Leroy Jenkins) and was a key member of Anthony Braxton´s Creative Music Orchestra. In the 1970s, Smith established the first of his own large ensembles (Leo Smith Creative Orchestra in 1979 and Leo Smith & The Creative Improviser Orchestra in 1981) and has continued to lead large ensembles ever since, including Wadada Leo Smith´s Silver Orchestra, which is active today. The musicians performing in this first incarnation of TUMO come from different generations, different backgrounds and even different countries, but are all brought together by their interest in creative improvised music. Saxophonist and flutist Juhani Aaltonen is a contemporary of Wadada Leo Smith and represents the first generation of European improvising musicians. He was already involved in some of the early international collaborations of the late 1960s and the early 1970s. Trombonist Jari Hongisto, pianist Seppo Kantonen, harpist Iro Haarla and bassists Ulf Krokfors and John Lindberg can, in turn, be seen as representatives of the next generation of modern improvising musicians who emerged in the 1970s or the 1980s and have already been leaders on their own respective instruments for two decades or more. And, finally, the rest of TUMO is comprised of younger musicians, some with a background in jazz and improvised music, such as trumpeter Verneri Pohjola, saxophonists Mikko Innanen and Fredrik Ljungkvist, guitarists Mikko Iivanainen and Kalle Kalima and drummers Mika Kallio, Stephan Pasborg and Janne Tuomi, and others with a background in classical music but an interest in improvisation, such as horn player Kalle Hassinen, tubist Kenneth Ojutkangas, accordionist Veli Kujala, violinists Terhi Pylkkänen, Barbora Hilpo and Niels Thorkild Levinsen, and cellist Iida-Vilhelmiina Laine. Altogether, in this first appearance, TUMO is a unique, one-time-only meeting of a diverse group of high-caliber musicians.